Medfield Animal Shelter News: More Birthday Donations! Though the animals of the Medfield Animal Shelter are all waiting for families to call their own, they are actually very fortunate in some ways. The reason is that so many nice people help them feel safe and loved while they wait. 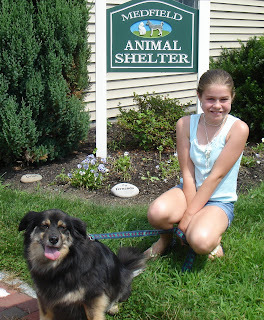 Izzy is shown here with her dog she and her family adopted from Save A Dog. Izzy gave up birthday presents so she could help the animals at the shelter. Instead of her friends and family buying gifts for Izzy, everyone gave a donation to the Animal Shelter. What a truly thoughtful thing to do. The animals as well as shelter volunteers are so thankful to Izzy for this kind deed.